Silva Screen has long established its 100 Series as the ultimate collection in any genre and 100 Greatest Musicals is no different. 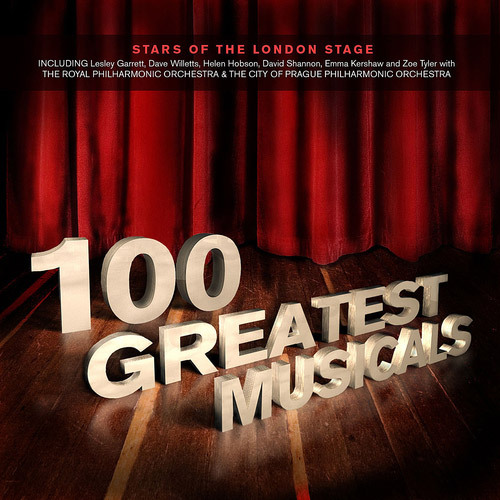 Tracing through the history of stage and song from the influential 1927 musical hit Show Boat to 2010’s highly anticipated release from Andrew Lloyd Webber, Love Never Dies, this comprehensive collection features vocals from The Stars of the London Stage including Britain’s most loved soprano, Lesley Garrett, Dave Willetts, Helen Hobson and David Shannon. The 6 CD collection highlights 83 years of the genre, from the post-war golden era dominated by Rodgers & Hammerstein, Irving Berlin, Lerner & Lowe to the next generation of Sondheim, Kander & Ebb, Lloyd Webber & Rice. As part of this epic release, Silva Screen with its partners Pure Solo and The Stage, ran an exclusive competition to seek out the next musical star. Through weeks of auditions we allowed the next wannabe musical stars to record and upload their auditions from a selection of musical hits, three for the boys and three for the girls. The winner was James Loynes who auditioned with a fantastic version of the Phantom Of The Opera hit, All I Ask Of You, which is featured here on disc 5. Performed by The Royal Philharmonic, The Philharmonia and The City Of Prague Orchestras.